Protect your Slide-in Camper from the elements with a Truck Camper Cover that’s water-repellent and breathable. Covering your Slide-in Truck Camper helps prevent costly cosmetic damage that can be caused by prolong exposure to sun and moisture. We stock Classic Accessories and ADCO truck camper covers in quality fabrics like SFS AquaShed and PermaPRO. Our covers are guaranteed to fit, and feature zippered access panels at the rear for easy access when covered. For best results, slide the easy-to-install SFS Aquashed, with its breathable polypropylene side panels and highly water repellent triple layer top, onto your truck camper any time that you are not using it. Allow our durable cover to take on environmental abuse so that your truck camper doesn't have to. ADCO, the oldest protective cover company in North America, has covered all of the basics needed to protect any RV. Not satisfied with the basics, ADCO has taken RV protection several steps further, with vinyl reinforced front corners to protect the cover from wear, zipper entry doors for easy access while the unit is covered, and a front and rear cinching system to provide a snug, nice looking fit. With prices starting at $250, you won't find a better value in RV covers for your truck camper. 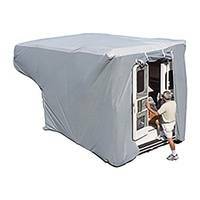 Classic Accessories is quickly becoming one of the biggest RV cover manufacturers in the industry. Well-known for their light-weight, rip-stop polyester and limited lifetime warranty, you will find yourself quite pleased with this cover for your Truck Camper. This woven polyester cover will provide you the utmost protection from Sun/UV damage, while remaining breathable and water-repellent. Classic designs their covers with high-quality features including elasticized corners, built-in strap system with weighted toss bags, and tightening straps to provide you with a custom-like fit.